Even as Spain celebrates it maiden World Cup title, rediff.com too celebrates by presenting its maiden football awards. It is a cross between the Oscars and the Razzies. And to be honest, it wasn't a difficult selection to make. Simply put, each of the categories has an outright winner. Diego Maradona wins it hands down. Be it his verbal duels with Pele and Michel Platini, his views on the controversial Jabulani or his back heels from the touchline, the Argentina coach displayed every bit of the character that he is. While his quotes ensured a print journalist's copy, his antics, on and off the field, were a delight for the television scribes. And he invited trouble on more occasions than one. "We're going to go and beat them in their half," Maradona said, ahead of Argentina's match against Germany. The Germans didn't like it of course. The end result: the tournament witnessed the exit of a great team and the fans missed more antics from the lone entertaining character. The England team wins it comprehensively. Despite the hype and hoopla surrounding their campaign it was always certain that the Three Lions won't last long. And after somehow scraping through to the second round, England were thrashed Germany, the 4-1 in Bloemfontein being their worst World Cup finals defeat. A British member of parliament even demanded an inquiry into the state of English soccer, branding the national team's performance at the World Cup "pathetic". Conservative lawmaker David Amess said on his website that he was so appalled by England's performance that he filed a parliamentary motion demanding action. The motion urges parliament to voice "its great disappointment at England's pathetic exit from the World Cup finals" and says the team "let this country and their supporters down". It calls for an urgent inquiry into the state of the national game and says many players in England's highly-rated Premier League are "grossly overpaid and under-perform". However, for those outside England, the early exit was hardly a surprise. For in sporting circles, there are two teams which are most predictable: England in football and India in cricket. Both of them high on hope (read hype) and low on scope (read performance). 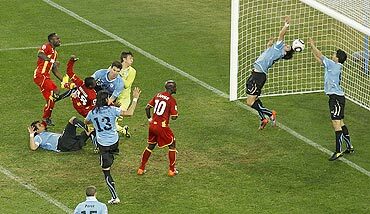 Uruguay striker Luis Suarez's flying one-handed block of Dominic Adiyiah's diving header in the last minute of extra-time in their quarter-final against Ghana was an effort most keepers would have been proud of. 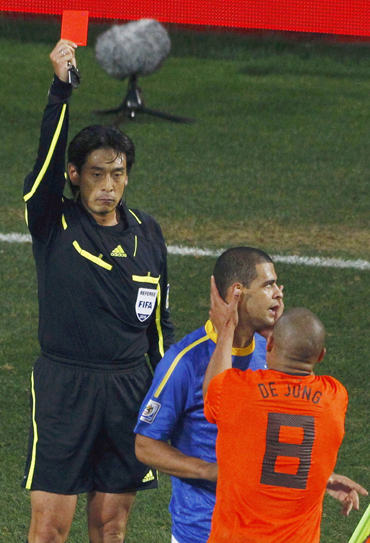 But it earned him a red card and his country a passage to the last four for the first time since 1970. Portuguese referee Olegario Benquerenca pointed to the spot but Asamoah Gyan failed to convert and in the shoot out that ensued, Uruguay substitute Sebastian Abreu got the decisive penalty with a cheeky chip over goalkeeper Richard Kingson to add to the African's woes. Uruguay thus ended Ghana's dream of being the first African team in the World Cup semi-finals, winning 4-2. "It was worth being sent off in this way for because at that moment there was no other choice," Suarez said later, claiming the 'Hand of God' was now his. His supreme sacrifice ensured he missed the semi-final against the Netherlands. But the best compliment came from teammate Diego Forlan. "It was a pity Suarez was sent off. Instead of scoring, he saved one, he saved the game," said the Atletico Madrid striker. Considered one of the favourites for the title, La Albiceleste went down rather tamely to Germany in the quarter-finals. Diego Maradona's appointment as the national team coach in October 2008 can be best described as a tenure that has been a roller coaster. Argentina struggled to qualify for the World Cup, absorbing embarrassing losses against Bolivia (6-1) and Brazil (3-1). But the team seemed on course in South Africa for a third World Cup title after group-stage wins against Nigeria, South Korea and Greece. 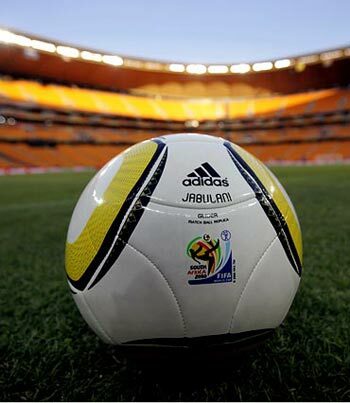 It defeated Mexico 3-1 in the round of 16, leading Maradona to boast about the team's scoring prowess. Then came the humiliating loss to Germany, which again led many to question Maradona's tactical knowledge. The legend's future hangs in balance. "I saw the ball coming, thought I had it covered, but missed it." 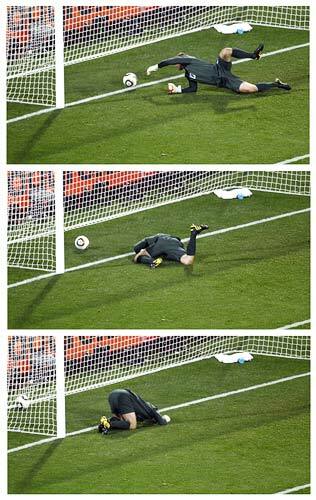 Robert Green describing the moment of horror when he allowed Clint Dempsey's 40th minute drive to slip from his grasp and bounce into the net when he appeared to have it under control. "I saw it all the way, it was my mistake, no one else's but what can I do?" he admitted as well. The England goalkeeper received stinging criticism following the horrendous mistake which cost his side victory in their opening World Cup game against the United States. The West Ham United keeper's slip in Rustenburg wiped out Steven Gerrard's early goal and the 1-1 draw complicated England's progress in the tournament. "Hand of Clod" was the front page headline in the popular News of the World above the question Should Green be Dropped? The Sunday Mirror ran the same headline, a re-working of the "Hand of God" description of Diego Maradona's controversial goal against England in 1986. Green was dropped from the subsequent match. But the damage had been done. Felipe Melo is the winner here. The Brazilian defender was the protagonist-turned-antogonist in the Selecao's 2-1 quarter-final defeat to the Netherlands. Melo's pinpoint 30-metre through ball dissecting the Dutch defence helped Robinho put Brazil ahead after just 10 minutes. And throughout the opening half he was at his best, thwarting the Dutch attack. However, after the break Melo's luck turned against him. Tempers flared thereafter and Melo was given his marching orders 17 minutes from time after stamping on Arjen Robben, venting his frustrations at the Dutch striker's ease in tumbling to the ground under challenges. Newspapers later explained Melo failed to heed his father's warnings and paid the price. The Brazilian has been habitually booked over the last two seasons, something he recently said he regards as an occupational hazard, and has also been red carded six times -- twice each with Fiorentina, Juventus and Brazil. Before the World Cup, many Brazilians, including his father, were worried his tendency to rash challenges could leave their team down to 10 men at the crucial stage of a knockout match. It was exactly what happened. This award is shared by Diego Maradona and Larissa Riquelme. The Argentine legend was the first to announce that he would run naked on the streets of Buenos Aires if Argentina won. The Paraguayan model made her announcement soon after. 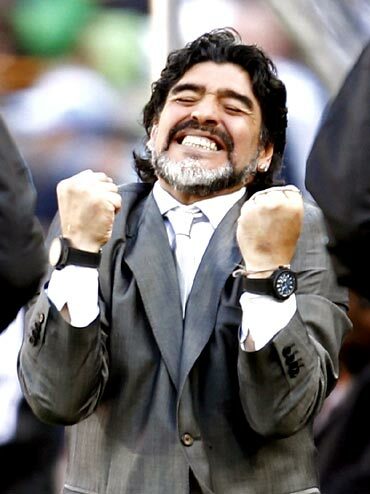 Argentina's earlier than expected exit saved us the blushes (Imagine the legendary Maradona running naked). While Maradona doesn't need to fulfil his promise his side lost in the quarters, Riquelme has announced that she will. We wait with bated breathe for this one. 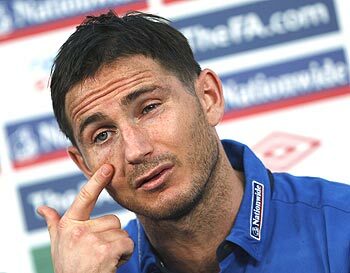 Frank Lampard gets this one. The Germans had cried foul regarding Geoff Hurst's second goal but their pleas had fallen into deaf ears. England went on to win the title then. Forty four years on history repeated itself. However, on this occasion it went against Enngland. Lampard's shot appeared to have landed inside the goal but was not allowed. Had it been allowed it would made it 2-2 and enthused a thrilling climax. What happened we all know. The Indian media takes the trophy on this occasion. Had it been cricket, the Indian media going bonkers was understandable. Of the six countries that play the Gentleman's Game seriously, India is certainly among the best. But when it comes to football, India is light years away from making it to the World Cup finals. Considering that, the efforts of the Indian media needs to be applauded. Every detail of the competition was covered. While the newspapers exhausted reams explaining the details, the television channels for once forgot about cricket. We too deserve some credit. Look at the icon on the homepage and you'll understand why. India hosts the cricket World Cup in less than a year's time. Can we expect journalists from Spain, Uruguay or for than matter most of the countries to cover it will equal vigour? The answer (an obvious no) explains the popularity of a sport that's truly global.